This double barre ballet bracket is manufactured by DuroBarre Manufacturing. The surface is powder coated with antique bronzed texture. It fits aesthetically in any studio or home. All the corners are rounded to give a smooth and subtle appearance to blend into the surrounding. It is very sturdy and built with quality in mind. We offer 3 years warranty behind our work. The 3" bracket is designed for connecting two barre. 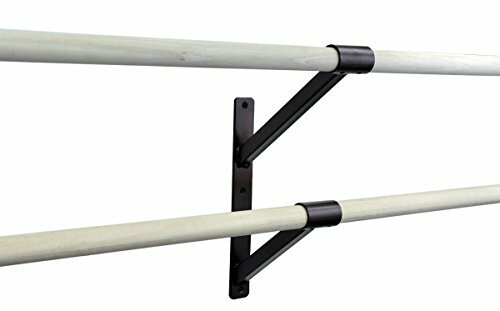 This listing is for ONE bracket only; You must have a minimum of 2 brackets to support a barre. This bracket will fit wooden barre/dowel that is approximately 1-3/8" in diameter. Please make sure you're able to find a 1-3/8" diameter dowel before purchasing. -Top bracket extension from wall: 9"
-Bottom bracket extension from wall: 7"
-Clear diagonal space between barres: 8"